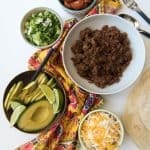 Taco meat is easy on a weeknight, even when you don't have a packet of taco seasoning on hand. This Whole 30 compliant version comes together in a snap. In a large pan over medium heat, brown the ground beef. Drain excess fat. Add tomato paste, water and all the spices to the ground beef. Stir to mix them together, and bring to a simmer. Cover and simmer for 5-10 minutes then remove from heat and use for tacos, nachos, or taco salad. Recipe lightly adapted from a slower cooker version found at Rubies & Radishes.